It’s the sad story of so called Islamic revolution of Iran. Iranian people who wanted to be freed from cruel regime of Shia Raza Pehalvi got stuck with manic Mullah regime. Regime who consider Islam as a sadist tool to subjugate women and punish minorities. Youtube & internet is filled with disgusting stories from Iran. Mullah regime has not only used batons to beat women for not wearing so called hijab or Chodar but also imprisoned ladies for fashionable clothes and showing off nice shoes. Women and men been arrested and punished for walking together on the street with out proof of marriage. Why Mullah’s Islam start with Hijab and ends with beard ? I don’t get it. Hijab is a personal matter why being handled by public authority ? Even if it’s a sin, there will be a judgment day. Why Mullah have to act like a God ? These Mullah are more disgrace to Islam than these women who don’t wear hijab. 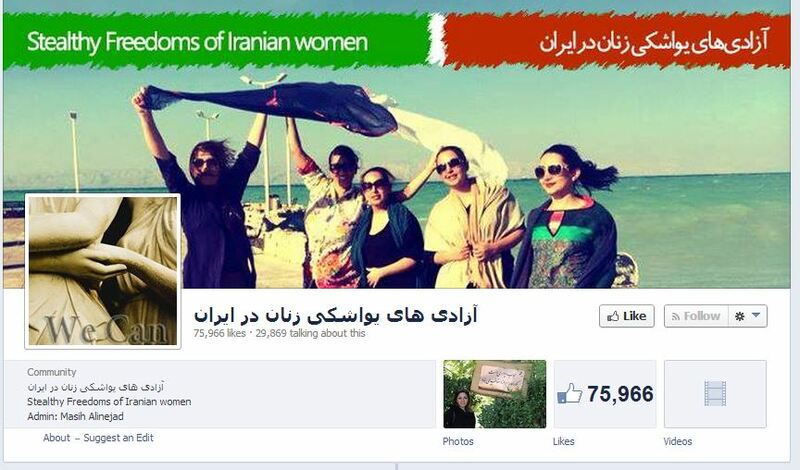 Look at this page despite of complete ban on Facebook in Iran there are 75000 people who like this page. Don’t you think it’s a matter of shame for this regime ? Regime who claim to be ruled by a Faqih on pretext of representing 12th Imam Al Mahdi al Qaim (a.s) explain when Maula Ali (a.s) interfered people’s personal lives ? when Ali the best man in Islam during his reign placed women in jail for not wearing hijab ? How many hangings did Ali ordered for people who used to do drugs ? Please don’t say that there were no drugs at that time as if there were not than Quran would not had mentioned to abstain ” Khumar “. Today youth in Iran are being hanged frequently for drug crimes. What this government does not get it is it’s the regime’s responsibility to provide free society to these youth so they can express themselves freely instead of relying on drugs. Is it not pathetic that women of Iran have to make a facebook page to show their resilience on the matter of hijab ? Iranian women should have an equal right to decide how to follow their religion and it’s only ALLAH who can judge their deeds on day of judgement. Remember Quran has said in Soorah e Baqarah ayat 256: There is no compulsion in religion. Than why Mullah are so compulsive ? Are they suffering collectively from OCD, obsessive compulsive disorder ? Than instead of ban & punishment to these lively women, Mullah need aggressive psychiatric evaluation and intense treatment. May be WHO, world heath organization should be requested to send teams of thousands of doctors and heath staff in Muslim countries specially Iran & Saudia to treat them from this disorder. In another ayat # 139 ofSurah e Baqarah Allah says ” Why you argue in the matter of religion despite that it’s Allah who is our and yours lord. Your deeds with you, our deeds with us.” Please ask any Mullah that where in Quran, Allah gave any Mullah of any time any authority to forcefully implement religion ? If Allah has not given such an authority to any Mullah than is it not that these Mullah are acting against Allah’s will ? If they are acting against Allah’s will than don’t you think that who they represent Allah or Shaitan ? Theocracy is the apex of all deficiency .Once Tehran was a European capital.Women will turn Iran a beautiful Garden. If pure and true islam was with love and care explained and shown to them they would never behaved this way.By nature all humans get attracted to beauty and true islam is beautiful.